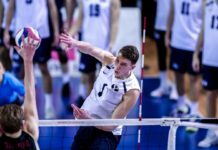 The Cougars lost their fourth game in a row to the Aggies, falling to 3-5 on the season and losing to Utah State in the Marriott Center for the first time since 1974. A poor second-quarter performance and 17 turnovers put the Cougars in a hole that they weren’t able to climb out of, despite a noble fourth-quarter effort. After three consecutive turnovers early in the game, the Cougars scored on a layup by Shalae Salmon with five minutes remaining in the first quarter. Devashrayee had five quick points in the final two minutes to give the Cougars their first lead, and the quarter ended 16-16 off a buzzer-beating layup by Paisley Johnson. The Cougars had a costly seven turnovers in the first quarter alone, making it hard to pull away. The Aggies started the second quarter on a 9-0 run, beating the Cougars to nearly every rebound. Paisley Johnson went on a 5-0 run of her own to cut the lead to just four, but another Aggie 3-pointer kept the Cougars at bay. BYU missed its last five shots of the half, and the Aggies led 37-27 at the break. Shooting woes and frustration over foul calls limited the Cougars on offense. They shot just 32 percent from the field in the first half. USU’s Olivia West had a game-high 15 points in the first half, going 3-for-6 on 3-pointers. The Aggies extended their lead to 15 early in the second half, followed by six consecutive points by Salmon in the paint for the Cougars. Salmon scored the first eight points for the Cougars in the second half. Devashrayee got in on the action with four minutes to go in the third quarter, scoring four in a row. The Aggies stayed locked in from deep, hitting back-to-back 3-pointers late in the third quarter. Johnson answered with one of her own in the final minutes of the quarter for the Cougars. She finished with a career-high 14 points and went 2-for-3 from 3-point range. Johnson filled in well for starting guard Brenna Chase, who struggled in the game, going 3-for-11 from the field. BYU began to full-court press the Aggies with seven minutes left in the game, still down by double digits. Devashrayee scored four quick points as part of an 8-0 run for the Cougars to bring it within seven with four minutes left in the game. She finished with a game-high 21 points. After the run, the Cougars missed four shots in a row, struggling to score down the stretch. Rachel Brewster hit a dagger 3-pointer with a minute left to all but seal the victory for the Aggies. 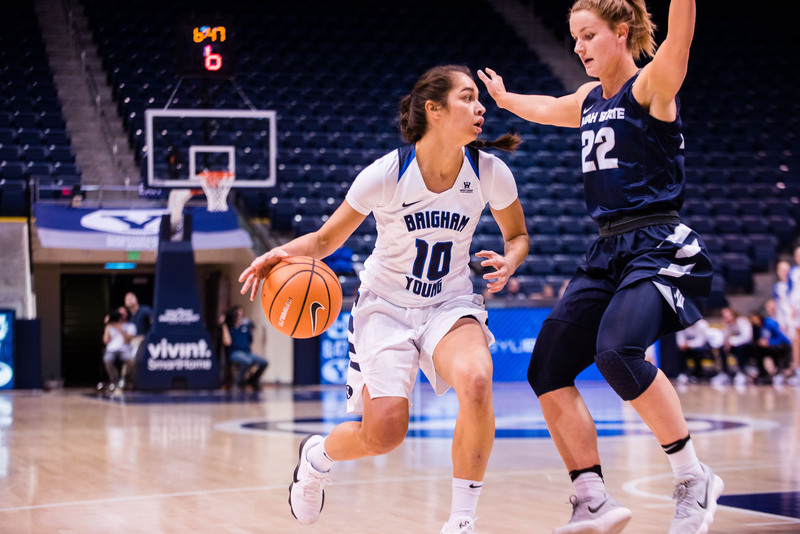 Brewster had 17 points in the game to lead USU, and the dagger was her first made 3-pointer after seven misses in a row. Several Cougars hit clutch shots in the final minute, including a three from Chase and an and-one from Devashrayee, but it was too late. With under 30 seconds to go, BYU was forced to foul, and the Aggies made their free throws to hang on to their lead. The victory was the first time USU women’s team has won in the Marriott Center since 1974. “This is a good win for us,” said USU coach Jerry Finkbeiner, explaining he was in college the last time the Aggies won in Provo against their rival BYU. The Cougars stay at home to take on rival Utah at 2 p.m. MST Saturday, Dec. 9, in the Marriott Center. The game will be broadcast on BYUtv.